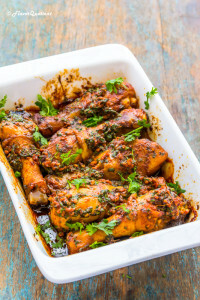 This superbly flavorful garlic and paprika chicken is a quick fix for busy weeknight meal which would be ready superfast using minimal ingredients! Total win-win, right? Many a times life takes a ride of roller-coaster and you have nothing else to do other than flow with the waves. Same is happening with me since last couple of months which was preventing me from sharing this delicious garlic and paprika roast chicken with ya’all. But I can’t hold it more! 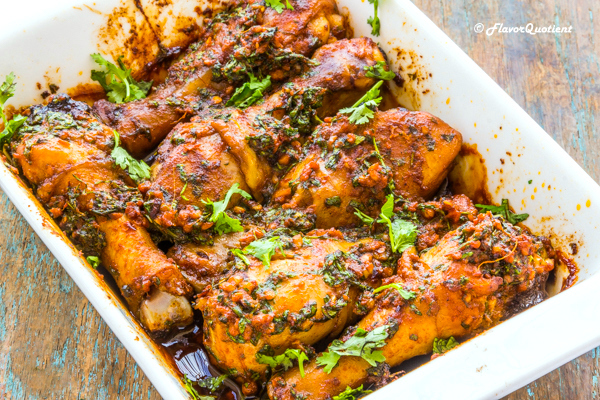 No matter how exhausted I am after spending the entire day at work, I could reward myself with a good night’s sleep only if I am able to share this stunning garlic and paprika roast chicken recipe tonight! This roast chicken recipe is a classic in its own way and you will love it no matter what! Still wondering how can I be so sure! Because the flavors of this garlic and paprika roast chicken is so immensely mesmerizing that it’s almost impossible to save yourself from being captivated into its awesomeness! 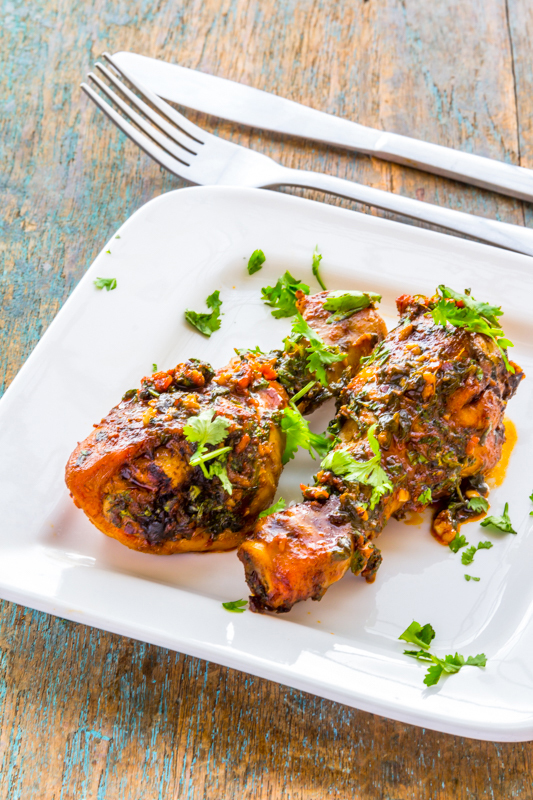 Best part is that there is nothing much to do in this garlic and paprika roast chicken! Only few ingredients create a magical amalgamation of flavors and you get one of the best roast chickens that you might have tasted recently. After making ample number of roast chicken recipes, I keep on looking for new ones to taste something different and good. This garlic and paprika roast chicken is inspired from one of my favorite food bloggers Jo who shares amazing array of recipes at her blog Jocooks.com. 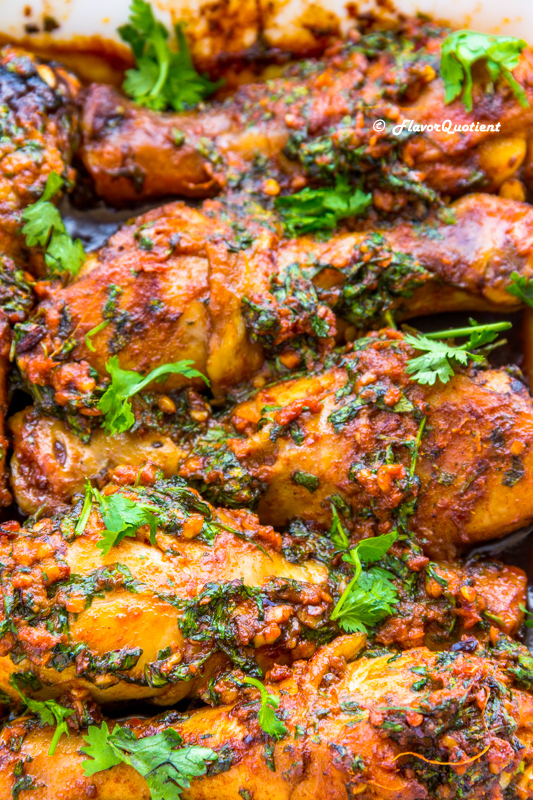 Garlic is one of my favorite aromatics which adds incredible flavors to chicken and with paprika added to it, the flavor is raised to a different level altogether. Even if you are not keen on cooking or a novice cook, this garlic and paprika roast chicken is an easy bet to start with. You will only need about 5 ingredients and rest of the work will be done by your oven or griller. This garlic and paprika roast chicken is a great option for weeknight dinner. Just add some fresh salad on the side and you have a tasty as well as fulfilling meal for your body and soul. This recipe of roast chicken will also become a crowd pleaser if you serve this in one of your house parties during the upcoming holiday season and your guests will love you for this! I suggest you make a large batch of this garlic and paprika roast chicken just to make sure you are not running out of it. Make the marinating rub ahead of time to keep it handy and just start grilling an hour before serving them and you are sorted! Heat a frying pan and add the canola oil to it. Once the oil is hot, add minced garlic and ginger paste. Sauté them on medium heat for couple of minutes. Next add the paprika and red chili flakes. Stir fry them on medium heat for couple of minutes more. The marinating liquid is ready. Transfer it to a bowl for further use. Take the chicken drumsticks in a bowl. Season them with salt and pepper to taste. Next add the prepared marinating rub and freshly chopped cilantro. Now using a spatula, mix the garlic and paprika mixture thoroughly with the chicken covering all the nooks and crannies of the drumsticks. Preheat your oven to 200 C / 400 F. Arrange the marinated chicken drumsticks in a baking pan, preferably in a single layer. Now bake the garlic and paprika roast chicken for 45 to 55 minutes or until the chicken is completely cooked. You can check the doneness of the chicken by cutting through the thickest portion of the drumsticks using the edge of a knife and the juices should run clear without any trace of pink. Alternatively, you can check the internal temperature using a meat thermometer and it must register at least 165 F / 74 C.
Serve the garlic and paprika roast chicken warm with your favorite salad on the side. Enjoy! Looks delicious will surely try can I put it in air fryer ? Made this tonight! Outstanding! In the recipe part you have garlic twice and missing the ginger. We are making this again!